Military Fantasy has been a staple of genre for decades. The Black Company, Malazan, Tchaikovsky's Shadows of the Apt, and the Warhammer universe are some good examples, but none that I'm familiar with tackle the military in the present times. 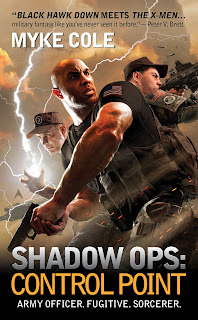 Contemporary Military Fantasy is something that we've clearly been lacking and Myke Cole's Control Point hopes to fill that void though it often has the feel of an Urban Fantasy even though much of the action takes place elsewhere. Given Cole's long military experience with 3 tours of Iraq he does have a unique experience to fuel the story. Cole's series opener provides deep glimpses of some of the harsh realities and amazing highs capable in a military life even while mincing in some geek humor to take the edge off. Magic has seeped back into the normal world giving abilities to certain people. The world knows magic exists and all those capable of it in the United States are conscripted into the military except for a few people adept in the forbidden classes of magic. Those are silenced less they become the monsters humanity has always feared. The legal schools include the basic elements of those that can summon storms, move the earth, control fire, and command water at will. Illegal ones include those that can animate the dead and create portals to anywhere at will. This sets up a class system that is easy to hate and turns magic users into little more than drones. At least those that acquiesce to authority. 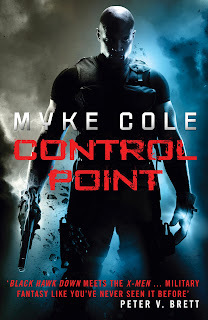 I ended up reading the first 2 chapters of Control Point 3 times before finally getting into the style as the first chapters can be difficult for those who abhor cold blooded killings of young people. That's exactly the choice that Oscar Britton faces in the opening pages. To do his job he must kill a teenager who has magic that she cannot be allowed to let loose. She's a Selfer who doesn't worry about the greater good. At least that is how the government characterizes Selfers. After that mission Britton is faced with an even tougher choice. He manifests abilities in one of the prohibited schools of magic and things take a turn as he runs. The biggest weakness of the novel is Oscar. The world is very compelling, the politics, the magic, and the different views on the same issues (magic). But Oscar just goes too much back and forth over what he wants to do, what he feels his duty is, and what he believes in. He fights himself too much. He is a military man so why turn away from that when it is what he loves? At points he acts totally for himself and never really accepts that certain events were totally his fault. Granted he isn't put in a good place and left with many decisions so perhaps this fault is going too much into his head in the narrative. But when the chips are down Britton delivers. Even with the weakness of Oscar I still ended up liking him. Control Point is at its best when the action happens, which is really quite often. Britton is flung from one life harrowing mission to another within pages. The magic is very impressive, especially when a skilled user is letting their full abilities loose. The sequencing of battles is particularly vivid. Picture those with the abilities from Avatar: The Last Airbender in modern combat situations from everything to a search a destroy mission in a sewer to an all-out battle on the field. There are a lot of aspects I wish were explored more such as China being a country where magic users are free to live a semi normal life along with the magical plane that is only sparsely discussed. Also, I'd like to know a bit more about how the common people view those with latent abilities besides awe and fear. Control Point is a solid, action packed debut with a few shaky parts that has a lot of appeal to it. By the end Cole more than found his footing and left me with high hopes for the continuation of the Shadow Ops series. I give Control Point 3.5 out of 5 Hats. The sequel Fortress Frontier should be out in February 2013, which I plan on checking out. My review hit similar points to yours, I think, especially WRT Oscar. I had a lot of trouble with the arc of the protagonist and the somewhat generic alternate world. There was enough there that I would try the next one and hope for more of a payoff. I think he's got a good lead on what's going on. I'm actually interested if the next novel with show things from another perspective in addition to Oscar. Oscar really got on my nerves, almost to the point that it completely ruined the book for me. As it stands it was only ruined partially. I just can't get past the fact that someone who is supposed to be such an accomplished career soldier and officer keeps making the dumbest possible decisions each and every time. I doubt I'll read the next one.